Each component of the soil’s ecosystem has a specific function and each is vital to the sustainability of the ecosystem. Creating an environment that promotes the proliferation of soil microorganisms is the first step in obtaining nutrient dense plant growth. The mineral content of the soil and the soil’s physical structure are important for the plant’s well-being, but it is the life in the soil that powers mineral cycling and the soil’s fertility. It is the soil’s biological activity that makes the minerals and (added) nutrients available to the plant. Soil microorganisms solubilize mineral elements bound in the soil, build soil aggregates, aid in the uptake of water and trace elements, increase the porosity and gas exchange of the soil, and release plant growth hormones. Soil microorganisms and the enzymes they produce are the catalyst for nutrient dense plant growth. Without microbes, you WILL NOT achieve nutrient dense plant growth. 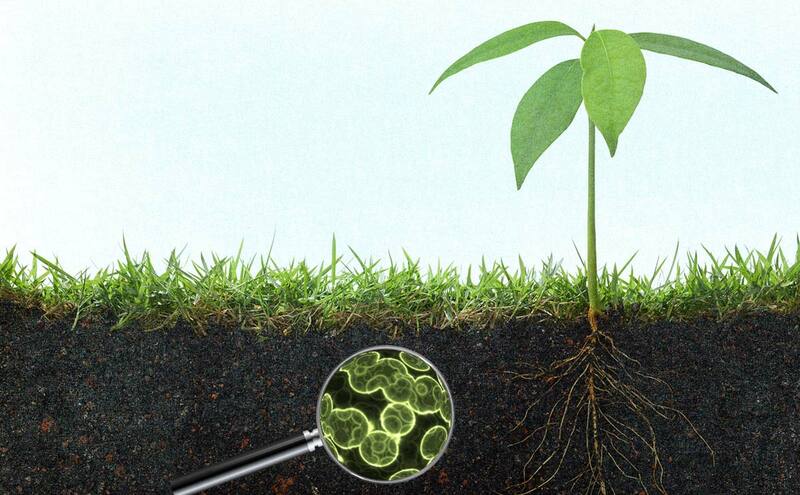 Within the aerobic zone of the soil, there can exist trillions of soil microbes. Much like the human or animal gastrointestinal tract, the microbes in the soil breakdown down organic matter and soil amendments or “food” for the plant to eat. In general terms, the soil is the “stomach” to the world. High salt fertilizers, herbicides, insecticides, pesticides, over cropping, excess tillage, and various other management practices are detrimental to the proliferation of the soil microorganisms. Many products are, in fact, antagonist to the growth of soil microorganisms. As we transition our soil away from these antagonist inputs, the use of a soil probiotic can be beneficial in accelerating the health and healing of the soil. As the agricultural community becomes more aware of the benefits of soil microorganisms, many products have come on the market. Many of these “bugs in a jug” boast high counts of a few select strains of soil microorganisms. Often sold in sealed containers these organisms are typically cultured in a lab, stabilized and sold for use. Many “bugs in a jug” are touted as the “silver bullet” intended to cure your soil’s every ailment. We choose to do things different. We choose the shotgun approach. Soil microbial diversity is the key to soil health. Rather than inoculating with one, two, three, maybe five strains of soil microbes, we choose to inoculate with a diverse assortment of soil microbes. Bacteria, fungi, actinomyces, protozoa, and nematodes all in one product. Sure, our numbers may not be as high as some “bugs in a jug” but our microbes, however, are aerobic, diverse, and ready to be activated. We achieve this by extracting soil microbes in the field and immediately before application. We spent many years experimenting with compost teas, “bugs in a jug” and other microbial products. Our results indicated that with each application we were simply spraying dead “bugs”. The responses in plant growth and health were short lived and our input costs where increasing. It appeared that we were simply applying a form of organically chelated fertilizer “dead bug bodies”. There was no sustainability or proliferation of soil microorganisms. So, we went back to the drawing board. We then decided to try focusing our efforts on developing the “best” compost possible. Diverse sources, blended together to achieve a harmonious ecosystem of microorganisms or what we call BIO-5 DRY. Once we had the “best” compost possible we simply had to extract. Many styles of extractors are on the market. We use a commercial extractor which allows us to extract our microbes immediately before application maintaining aerobically diverse microorganisms or what we call BIO-5 extract. When the extract is mixed with our various other nutritional amendments they begin to activate. The product is applied immediately after extraction and thus we are inoculating the soil with aerobically diverse soil microbes, which will activate based on the soil conditions. As the soil conditions change different microbes will “wake up” or activate creating a layering of microbes in the soil or “food web”. Rather than trying to manipulate nature, we are letting nature dictate which microbes survive and which don’t. We supply a diverse inoculant and let nature take care of the rest. Our way keeps input costs VERY low, results HIGH, and sustainability is achieved through diversity. Contact us for more information on extractors and extracting your own microbes.